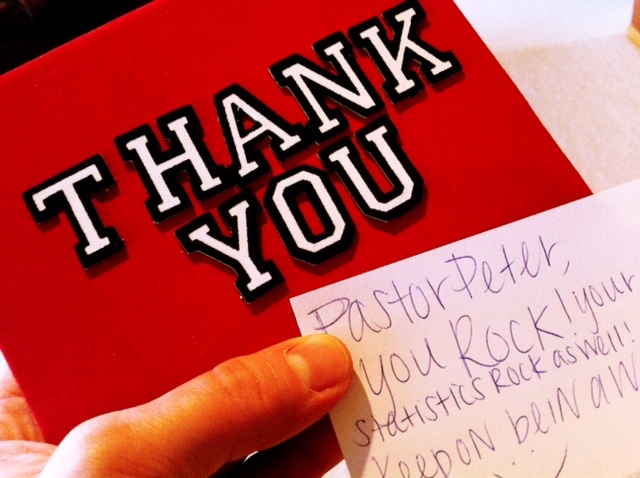 Study Finds: Young Pastors are Lonelier & More Discouraged than Most. Recently, some delightful members of Substance gave me a “Thank-you” book filled with affirmations from our congregation. People wrote little testimonies and encouragements. And every time I see it, my heart fills up with God’s love. And I have to say: Those encouragements have meant a LOT to me this year. This last year has been a tougher year for my wife and me. And thankfully, God has given us an amazing staff and new group of leaders to help take our church to the next level. Unfortunately, I think there’s a good number of pastors who don’t experience enough of this. I think we’ve all heard the stats on pastors wanting to quit. For years there have been studies showing that more than half of all American pastors would quit if they had a good alternative to fall back on. And as a person who coaches pastors every single week I have to admit this is true. Very few people understand how political pastoring can be today. But a new study by LifeWay research really caught my attention. When I read this report alongside one of my friends, he said: “Wow Peter… if this is true, you qualify for the loneliest and most discouraged group of pastors in the U.S.” Honestly, his statement hit me pretty hard – especially when Outreach’s lastest Magazine just put me on a short list of America’s youngest mega-church pastors. It’s like being put on a list for “those most likely to have a heart-attack” – it’s not something I’d want to frame and put on my office wall. Yet, it’s a tragic reality… especially when there’s already a famine of young pastors hitting almost every major denomination. But Why? Why the loneliness and discouragement? Here are a few of my opinions. Young leaders feel lonely because, there simply aren’t a whole lot of them. Like I argue in the latter chapters of my book Pharisectomy, the median age of American pastors is now approaching 60 years old. Yet the average receptive unchurched person is right around 20 years old. That’s a HUGE cultural gap by any standards. And whenever a person tries to bridge this massive gap, they’re going to be criticized by one group or the other (usually both). To make matters worse, there are an unprecedented number of opinions about the church right now. So, anyone who signs up for pastoring today, especially in a sizable church, has to embrace an ongoing amount of character assassination. There simply isn’t enough time to explain what you really think about an issue – or, why certain decisions are being made. So, pastors have to live with the reality that many people have false impressions of them. Thus, pastoring can be a difficult lifestyle for anyone who likes to control their reputation. My pastor friend Scott Wilson recently told me the story of when he first took over his senior pastorate. He asked his leadership board to write down their expectations of him. I.e., Six months in, what are they going to be judging him on? How will they know he’s a “good leader?” So he told them to jot down a few of their criteria down and hand it into him. After all, he needs to know these things so that he can judge himself by the same scorecard that they will be keeping. After getting each of these short lists, he started writing all the criteria on the marker-board. Some people said: “Good preaching,” while others wrote, “powerful worship,” while still others wrote, “a thriving small group ministry.” Others had a particular theological agenda in mind. Before long, the list on the board started stretching into 30-some items. Last week alone, I got a letter ripping on the shirt I wore, and another letter on “how I don’t feed them enough” – not to mention a flurry of cloistered facebook critiques. And to be totally honest, sometimes I deserve the critique. But that’s the hardest part about pastoring. The job is to preach God’s word in such a way that it provokes soul tension. And if these comments came from “crazy-Joe” or “freaky Frank” it’d be easy. (After all, freaky-Frank ALWAYS says weird things). But, the weirdest critiques generally come from people who are otherwise “normal.” So it gets really hard to know who you should be listening to. So here’s how I respond to all of this: (1). Sabbath Often: Nothing gives perspective like time away; (2). Make a short list of people you can take critique from: If you’re stupid enough to listen to everyone’s critiques, the devil will make sure you’ll hear an extra dose of them. In the end, you need to surround yourself with brutally honest people who are also capable of seeing the big-picture of the battle you’re fighting. (3). Don’t sulk, you’re not the only person experiencing difficulty: Just this week I was talking to a pastor from China who’s lost almost 1000 members of his congregation due to government persecution. It’s been a reminder of how good I actually have it. And just to encourage you leaders who think everything at Substance turns to gold, on the conservative side, we’ve had over 600 leave our church for other churches this last year. Thankfully, our growth rate exceeded this turn-over. But, it’s easy to feel wounded or rejected by this stuff. It feels like you’re the only person who’s really committed. But remember: that’s not true. Quite often we overlook the 6 positive statements as we obsess on the 1 negative. But we need to reverse this tendency. In addition, I believe that every pastor should have, at least, 3 intimate pastor friends they can commiserate with. Our problems are usually more common than we like to think. Lastly, (4). Know that God is defending you: Even Jesus had a “Judas who betrayed him” and a “Peter who denied him.” So why do we expect to do better than Christ? There will never be enough time to debate with our critics unless you sacrifice your family time to do it. So, do what Martin Luther did whenever he got overwhelmed: he meditated on Psalm 46. “Come, let’s sing the 46th Psalm,” he’d regularly tell his colleagues, whenever the political pressure seemed too much to bear. The Bible says that God will cause all of our unjust critics to “fall down at [our] feet and declare that [God] has loved us” (Rev. 3:9). And the more I meditate on these realities, the easier it becomes to “re-commit” to the imperfect bride of Christ. Why Do People Think December 21st 2012, Will be the End of the World? How to Recover from an Election Season with a Lasting Smile!